Juices in the Consumer Market Outlook include fruit and vegetable juices with a fruit juice content of 100%. The worldwide revenue of US$64 billion in 2018 is expected to increase to US$76 billion by 2023. Country ranking, including United States, Germany, United Kingdom, Argentina, China etc. This report from the series of Consumer Market Outlook segment reports gives an overview of the Juices market from an international perspective. This report from the series of Consumer Market Outlook segment reports gives an overview of the Juices market from an international perspective. 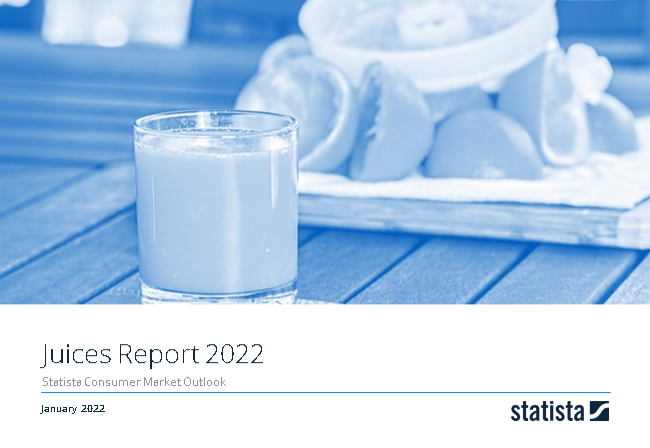 You can find further information on the topic on Consumer Market Outlook/Juices.